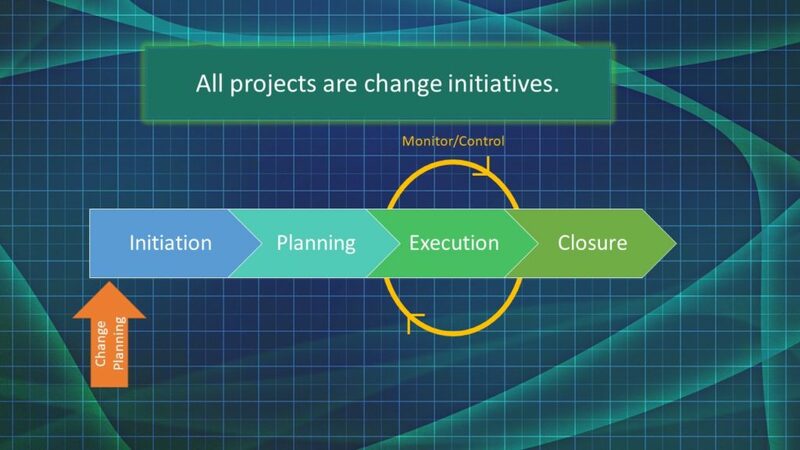 Classical project planning goes through initiation, planning, execution and closure cycles. Agile projects follow a similar model, just with faster and more frequent cycles between planning and execution. Typically – Change Management activities occur sometime during execution when the project team realizes that they need to implement their project to others. Most of us have seen how well this works. Organizations with more mature project and change management practices put change planning during the planning phase. This is typically where the stakeholder and communications management plans are developed, along with any RACI matrices. It is assumed that the project is a good idea and will be accepted when we get to the planning stage. I believe that if we put Change Planning in front of the project process, we can determine whether we should spend the time, money, and human resources on the project in the first place. We can better predict the chances of a project succeeding. And we can identify simple activities we can do to lay the groundwork for the change you wish to make. All projects are change initiatives. We are messing with how people do their work. And, frequently, whether we plan this or not, these projects have an impact on the culture – for good or ill.
By putting our change planning at the FRONT of our project cycle, during initiation, we can see whether the organization is ready for the change and start laying the groundwork well before the allocation of money and resources. You may find that the project may not need to be done in the first place.